The final curtain closes on yet another Rotary Year and it is indeed with honour and certainly a pleasure for me to stand before you and give an account of my stewardship 2016-2017. Permit me to thank the Lord first and foremost for seeing me through. My heartfelt gratitude goes to the Club who placed their confidence in me by electing me to serve as their President. Thanks to the Rotarians, the sponsors and my family and friends who also supported me during the year. The RI theme ‘Rotary Serving Humanity’ was put into action forthwith. 12 months later amidst the many challenges, I am pleased to report that all but one of the proposed programs and projects were executed through proper planning. We know that basic education and literacy are essential for reducing poverty, improving health, encouraging community and economic development and promoting peace. And the legacy lives on. Our main focus was literacy and quite a number of projects were introduced. In September, a dozen under privileged families plus a fire victim were presented with back packs and back to school supplies. This project stimulated competition in all aspect of learning both inside and outside of the class room. The student of the month was chosen based on qualities such as character and leadership, and not necessarily the academics or being an A student. The student of the month had to be a diligent student, completing his/her assignments on time, showing strong effort to learn the subjects, be a team player…… just to name a few. Thank you to Antigua Commercial Bank for their sponsorship of 72 ACB Junior Savings Account which were evenly distributed among the 3 schools. This account afforded each student an opportunity to secure their future college fund. Each student also received Stationery supplies and a monetary donation from the Club. Every school year, a number of our twin-island nation’s students become dropouts and or fail to graduate. We care deeply about helping students to understand the value of an education and how it will impact their quality of life, chosen careers and financial goals. Our goal therefore was to assist in empowering them with the most effective, powerful and vital tools that would have increased their career and life opportunities and foster educational development. It was with that in mind that the Club sponsored A Career Guidance Workshop for 4th & 5th Form Students of the Christian Faith Academy School. Our objective was achieved as the students expressed their thanks and appreciation and noted how much the workshop assisted them in making future decisions. Rotary’s Six Areas of Focus were also celebrated with a Book in a Bag and a Book Reading Competition for Grades 4 and 5 students of the aforementioned Primary Schools. The goal of these Competitions was not only to increase students’ capacity and vocabulary but also to stimulate the love for reading. Of course, Children love a challenge, so when we made reading into a competition, students who otherwise wouldn't want to read were excited to read as much as they could. The Book in a Bag competition was based on the written summary of the total number of different categories of books read. Allow me to recognize Rotarian Stanley Francis of National Tours, Mr. Samir Doumith of AHOD and Mr. Mark Lane of Paperclips for coming on Board to ensure the successful execution of these 2 projects. After missing a year, Computers for the World Project returned. Through a global grant from Rotary International, the Club partnered with the Belleview Breakfast Rotary Club and other contributors to make this possible. This year we celebrated 10 years of promoting Information Technology to the students in Antigua & Barbuda. In this project a team of Rotarians headed by Mr. John Martinka along with a team of Cisco Systems IT Students and Teachers headed by Mr. Jeff Mason from the Newport High School in Belleview, Washington State came to Antigua & Barbuda and installed computers and set up computer labs in both Government and Private Schools. This was done as a donation to the Ministry of Education to educate, to improve and advance the IT education for the Students on Antigua & Barbuda. Over the past 10 years, some two thousand, four hundred (2,400) computers have been installed and over 50 fully networked computer labs have been set up in the schools in our twin island state. There is also a Rotary Sewing Project executed jointly with the Rotary Club of Kirkland Downtown Washington State headed by Mrs. Jan Martinka. The initiative of this Sewing Project is to teach women how to sew, thus giving them the opportunity to become proficient in sewing and to be independent and self-sustaining. The local coordinator is Past President Cordel Josiah. There are six Rotary Sewing Projects set up on the island. The first is in the Grays Green community next to the Green Bay School. There is one in Freetown Village at the Methodist Church, one in New Winthorpes Village at the Wesleyan Holiness Church, another in Pigotts Village at the Bethany Moravian Community Center, another in Liberta Village at the Grace Hill Moravian Church, and the most recent which was launched on Monday 20th February in Bolans Village at the Bolans Penticostal Church. Please note that the classes are all free and opened to the General Public! A big thank you to the students, teachers and Rotarians of the Belle Vue Breakfast and Kirkland Down Town Rotary Clubs and also the ever ready and loyal Past President Cordel Josiah and other Rotarians who saw the project to fruition this year. In an effort to bring some Easter cheer, for the first time, an Easter Fair was hosted. We catered for 150 children from the lower income earning communities. They were graced with the presence of an Easter Bunny and were entertained with games and other activities. Each child received an Easter Basket or Bag. Our usual Christmas parties were executed in December where the Club caters for 250 students in Antigua and 250 in Barbuda. Similarly, the same courtesies were extended. A big thank you to Sunshine Ice Cream and Rotarian Cleveland Seaforth who are always there at our beck and call, and this year we say thank you to Frank Wall Ltd. for partnering with us. A healthy nation is a growing nation. Considering that obesity starts at the children’s level, Rotary’s aim is to change and improve their health for the future. Recognizing too, that practicing a healthy lifestyle starts with the youth, the Club initiated a partnership with the Medical Benefits Board and Mt. St. John Medical Centre by offering Grades 4, 5 & 6 students of the Five Islands Primary School a BMI Screening and Blood Sugar Level Testing. 123 Students were screened and tested. There were 10 referrals one of which was an emergency case. I am also pleased to report that medical assistance was offered to some members in the community who were very, very thankful for the Rotary Club of Antigua. Our monthly Meals on Wheels continued. This program is executed the last Saturday in each month, when Rotarians and Rotaractors come together and put 100 food bags together, all of which are delivered by members to the various needy persons around the island. Ladies and gentlemen, these projects could not have been possible without the support of the public, the members and corporate donors. Thank you very much. The Club continues to work with and support our Rotaractors & Interactors and let me take this opportunity to Congratulate Rotaractor President Shari Thomas and her incoming Board and wish them a very successful year. .
2 Interactors and a Rotaractor were sent to RYLA- hosted in St. Kitts this year. And most recently the PE and SE were sent to District Conference in Trinidad. The Club also continues a mutual relationship with the District through our AG Corina Sealy. Our monthly newsletter, the Cog and a few of our projects are featured on the District Website and RI Club Central Showcase. Other activities of the Club can also be viewed on Youtube. The District Governor Roger Bose visited during the month of September. He was well received and courtesy calls were made on the Governor General and the then Acting PM, Mr. Steadroy Benjamin. The DG also visited some of the Club’s projects. At our joint meeting, three young ladies were pinned as Rotarians. 2 from Sundown and 1 from RCA. A diverse growth of membership’s vocation in any organization is important and President Elect Eric will be looking forward to advance same in the coming months. The Club also entered the District 2-minute video contest highlighting ‘Rotary Serving Humanity’. We await the results. We were awarded the Zone 33-34 Public Citation and missed the Presidential Citation by 1 point due to resignation and migration of members. In the words of Paul Harris…quote ‘Whatever Rotary may mean to us, to the World it will be known by the results it achieves’. The Rotary Foundation celebrates 100 years of doing good in the world. It transforms our gifts into service projects that change lives both at home and around the world. Our gifts also help to eradicate Polio. Since 2013 the Bill gates Foundation has matched every $1 spent on Polio and a substantial donation was made at the Rotary International Convention this year. Rotary International is this close and the goal this year is to end Polio in the remaining 2 countries, Afghanistan and Pakistan, where there are only 13 and 20 cases respectively were reported in 2016. Fortunately for us this year, both Clubs welcomed the RIPE Ian Riseley and his Partner in Service, Judith. They were afforded a warm Antiguan hospitality welcome and visited various projects and places of interest on the Island. Their visit was highlighted by the hosting of a joint Cocktails at this very same venue. In recognition of the Foundation 100 years of Doing Good in the World, the Club bestowed a Paul Harris Fellow on Violet Lake, a teacher in excess of 40 years. Other Rotarians were also pinned. Those who attended the Cocktails can surely join with me in saying it was indeed an experience of a lifetime. A world of thanks to PP Denise and her team for successfully executing this function. Vocational Service is one of Rotary’s Avenues of Service recognized during the month of January. Through Vocational Service we Serve others by using our unique skills to address community needs. We Empower others through training and skill development. And Inspire others to act with integrity by following Rotary’s guiding principles. Rotary International also encourages Clubs to recognize persons in the Community who Serve, Empower and Inspire. One such person this year, was Lorraine Samuel, a teacher who has served selflessly and continues to serve the community for over 43 years. Member’s vocations were also featured on the Clubs Facebook page. Jointly with Rotary Sundown, we experienced some great Fellowships this year and look forward to its continuation in the upcoming year. Hats off to Rotarian Dr. Vanetta Rodgers who ably executed the many social functions and meetings which were held. Special mention must be made of the World Peace & Understanding Church Service and after Fellowship Brunch. 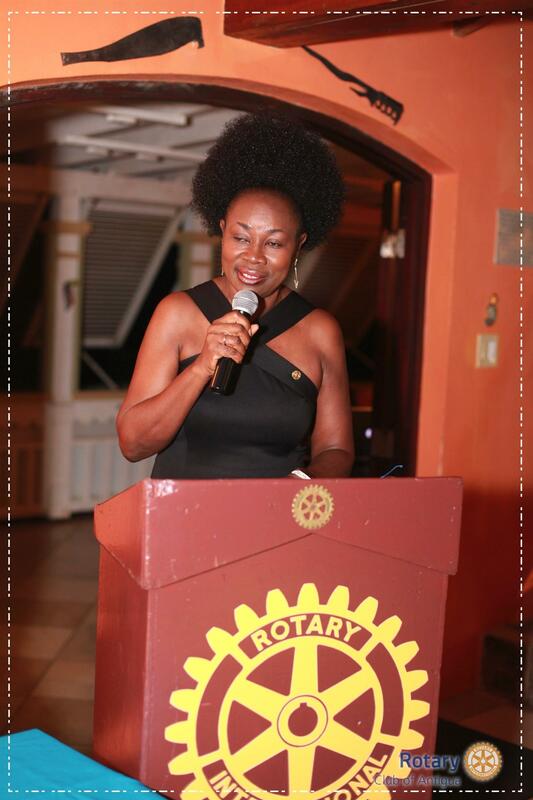 Thank you again Rotarian Vanetta for being such a gracious host and living the Motto….Service Above Self. Thanks also to PP Gordon for hosting the very first joint fellowship in August which we all enjoyed as well. Colours Fete, the Club’s major fund raiser was executed last year under the theme “Colours in Africa”. It was well attended and well executed and we certainly brought Africa to Antigua on the night of July 16, 2016. A wealth of gratitude to the many patrons and sponsors and corporate donors who supported us. I also owe a debt of gratitude to my Team which was headed by PP Ato. This year, it’s that time again. It’s our 10th Anniversary. The big day is July 15 under the Theme: Colours of the Sea. It will be held at North Sound Marina commonly known as Crabbs, just outside of Parham. . To date quite a number of sponsors and corporate donors are again with us and we sincerely thank them for allowing us to advance the work of Rotary. The cost this year is $250. Remember it’s all inclusive where everyone is a VIP. For persons who do not eat sea food, we will be catering for all food groups. To all who contributed towards the Club’s projects and programs this year, words are not enough to express my gratitude. I could not have done it without you. I wish also to thank the Board Members who supported me and kept me on the right tract whenever it appeared as if I was straying. My friends I’ve made it clear, I have stated my case, of which I’m certain. I did what I had to do; I saw it through without exemption. Yes there were times; I guess you knew when I bit off more than I could chew. And through it all, when there was doubt, I ate it up and spit it out. I faced it all and I stood tall; and did it my way. My tenure as President was a learning experience and a time in my life that I will never ever forget. Amidst it all, it was a pleasure to have served the Club at this level. As I demit office, I wish PE Eric and his new Board a very successful year as they continue into RI Theme this year… Rotary Making a Difference. I pledge my continued support.